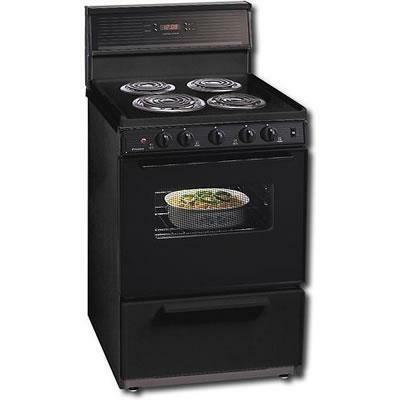 This Premier Ranges 24 Inch Electric Range comes with 4 Coil Elements Burners and a 3.0 cu. Ft. Manual Clean Oven with Black Glass Windowed Door and Light. This range comes with a 10 Inch Tempered Glass Back-guard with Clock/Timer. All Premier Electric Ranges have a Signal light that indicates hot surfaces. Premier Electric Range has a porcelain finish top that makes cleaning much easier. It also include heavy duty grids with porcelain finish. This Premier 24 Inch Electric Range comes in a very attractive Black on Black perfect to compliment your kitchen.